I am a huge tortilla fan. I eat them with breakfast, lunches and dinners if I can. Buying tortillas at the store can cost 4 bucks for 10 which isn’t too bad, but for this household it is because we go through at least 30-40 a week with just the two of us. I told you I was obsessed.The other issue with buying tortillas at the grocery store is that many contain lard or other meat byproducts and I am just not down with that as I mentioned in the homemade sun-dried tomato wrap post. 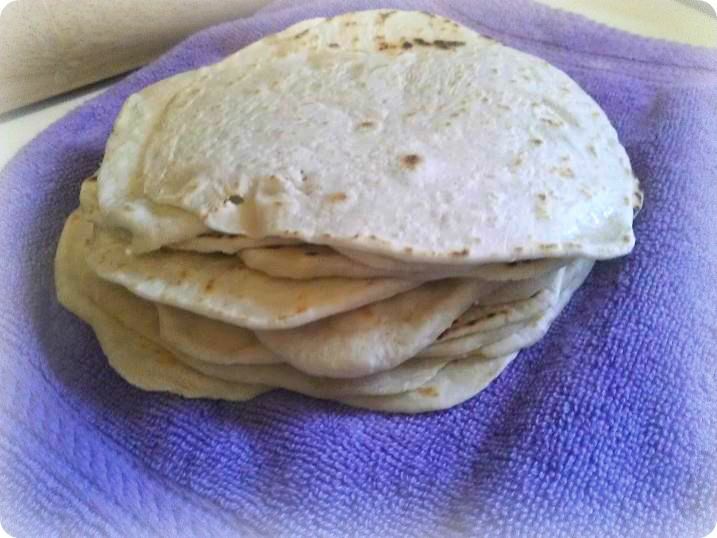 Since we eat so many tortillas, it was important for me to find a recipe that was simple, veggie friendly and can be made at a last minute notice. I tried countless tortilla recipes and the one I liked the most, I adapted from here. This week all of the recipes I post will showcase an exciting way to use tortillas and the ideas stem from the concept of making tortillas at home. Let’s kick this week off with a simple tortilla recipe. Mix the dry ingredients in food processor with dough attachment (or use hands). Add oil and a little water at a time until you have a soft (not sticky) dough. On a floured surface, knead the dough for 2 minutes, adding flour if the dough is too sticky. Form a dough ball, cover with towel and place upside down bowl over it for 10 minutes. Heat an ungreased flat griddle or skillet on medium high heat. Break off small pieces of dough and roll out in a circle shape until thin. Cook tortillas on griddle for 30 seconds and flip and cook for another 20 seconds (tortillas should have some brown specs on them when finished). Serve warm or if making in advance, allow to fully cool and then fold the tortillas in a towel and place in a Ziploc bag. They hold well for a few days.